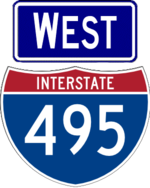 I-495 is the main expressway across Long Island and is composed of the Queens-Midtown Tunnel and the Long Island Expressway. It originally entered New Jersey via the Lincoln Tunnel and was planned to connect via the cancelled Mid-Manhattan Expressway, with the extension across Long Island numbered NY 495. 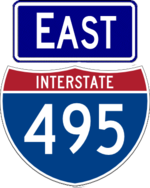 In the early 1980s, I-495 was exteneded across the rest of the Long Island Expressway, replacing NY 495, and the route through New Jersey and the Lincoln Tunnel renumbered as NJ 495 and NY 495. Plans also existed to extend I-495 to eastern Connecticutt or Rhode Island via a bridge across the Long Island Sound, which were cancelled due to public opposition. The divided highway portion of Suffolk CR 48 is a remnant of the proposed extension of I-495.